I've been a fan of Nicola Yoon ever since I read Everything, Everything. 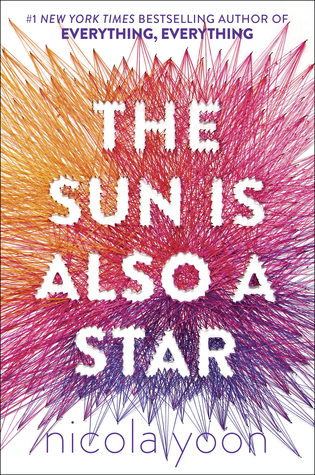 I fell in love with that book instantly and now, I've been looking forward reading The Sun Is Also A Star with high expectations, and to be honest, the author never failed to amaze me. The Sun Is Also A Star is another worth buying and reading book. The book is all about a Jamaican girl who will be deported because of their expired visas and documents. And about a Korean-American boy who will be having his interview for Yale to study a doctorate degree. Their paths crossed in an unplanned way, their story started in a weird way but everything worked out for them. Tested love in scientific way, random questions and other adventurous things just for a day with a complete stranger. It's funny how someone who doesn't mean so much to you before became your world just being with them for a day. "You can't persuade someone to love you"
With all honesty, this was the only book I read during my long weekend break, I was busy from the previous days and this book was out November 1st, Belated Happy Book Birthday again! I love everything about this book. The cover? It is stunning! I love the color combination of the cover. It is perfect! I can stare at it all day without getting tired. The story? I really enjoyed reading it, such a light read and the story is catchy which is impossible to ignore. The book gave me hope even at the ending. I knew it wouldn't end bad but still I got carried away with the story and my guesses were mixed up, I'm grateful that the book ended in a good way. Words aren't enough to describe about The Sun Is Also A Star. I get this hyper feeling that I want to spoil everyone with what was written but I knew I can't. I just can't… readers have to find it out on their own. All I can say is that, I love this book and I'm looking forward for more Nicola Yoon masterpiece. "Sometimes the truth can hurt more than you expect"